Geralt of Rivia, Gwent champion and monster slayer, is probably not a fan of rest and relaxation, which is why he’s got another adventure in him. 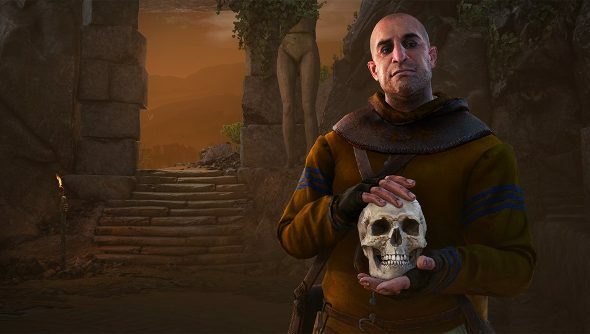 Hearts of Stone, The Witcher 3’s first expansion is due out very, very soon. So why not watch the launch trailer while you wait? If you’ve not checked out the base game, get on it. The Witcher 3 is one of the best PC RPGs for a reason. Ghosts, the curse of immortality, a heist — lots to look forward to, then. CD Projekt Red says we can expect 10 hours of new adventures, another choice-driven quest and, of course, a new “romance” option. It all looks quite spiffy, and the trailer’s got me all a tingle at the thought of another romp around the countryside with old Geralt. It’s also an excellent excuse for me to play through all the free DLC that I missed by finishing the game in the first week. Also, that head trick… crikey.